The rotor blade is particularly significant, as it is the “motor” that generates the energy output and thus determines the commercial profitability of wind power farms. The aerodynamic shape, high specifications and robustness of this, the most crucial component of any wind farm, requires special materials and production processes. SINOI is well equipped with all the latest production processes – in-house prepreg technology, vacuum infusion or reaction-injection moulding (RIM), RIM-carbon and prepreg technology – and successively employs all these methods in series production. These production processes are combined and constantly refined to achieve the best possible results. On the basis of serial production experience with these manufacturing methods, new processes are constantly being devised and employed. Due to consistent use of high quality epoxy resins as well as highly qualified staff with long-time experience and extensive quality controls, the rotor blades are distinguished with the very high and accepted quality standard “Made in Germany”. Further benefits include: virtually shrink-free curing, extremely high holding properties, minimal weight plus high durability and constant resonant frequency. Special quality assurance features of the SINOI blade production include its materials management system, non-stop inward goods inspection, reset control checks of each rotor blade, plus predetermined stopping points in the production line. Thanks to its comprehensive quality assurance measures, SINOI laid the right foundations for GL certification as an industrial producer of fibre-reinforced plastics. 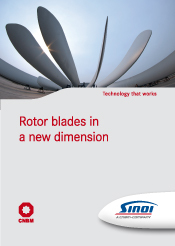 This means that all rotor blades produced by SINOI come with certification from Germanischer Lloyd.